FLYING Sikh Milkha Singh has so many firsts to his credit. Not only did he excel in track events but has been a trendsetter in other areas too, he was the first Indian athlete to get the Padam Shri in 1959. "It was in 1957 during Indo-Ceylon sports meet that I met Nirmal for the first time," he recalls. Nirmal had gone there as captain of Indian women's volleyball team . But Milkha Singh soon forgot about her, as other girls came and went out of his life. "It was in 1961 that Nirmal joined the Punjab Sports Department as Assistant Director. That is when I got interested in her again. 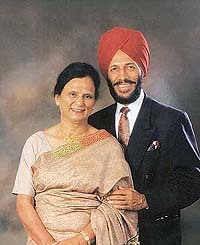 And in 1962, we got married," says Milkha Singh claiming credit for the first "sports couple" of the country. And this sports couple has produced Chiranjeev Milkha Singh, one of the most promising and talented golfers of the country. Though Milkha Singh refused to accept the Arjuna Award in recognition of his lifetime achievements in athletics, his son is a recipient of this national sports award. A keen golfer, Milkha says that his happiest occasion was the Cardiff Commonwealth Games where he won the 400 metres gold. The Duke of Edinburgh and the Queen came for the medal presentation ceremony. It was during the ceremony that Ms Vijaylakshmi Pandit, Prime Minister Jawahar Lal Nehru’s sister, and India's High Commissioner to UK that time, came to him and conveyed the message of the Prime Minister, congratulating him on his superb success. "The Prime Minister wanted to know what I wanted in return for what I had achieved on the track. I told Ms Pandit that my wish was that a holiday should be declared the next day in India to celebrate my gold medal-winning performance. A holiday was declared by Pt Nehru," recalls Milkha Singh. "Things like asking for a monetary benefit, allotment of a plot or a government job never occurred to sportsmen of that time," he adds. "My most disappointing moments have been the gruesome murder of my parents in front of my eyes in 1947 and my failure to win the Olympic Gold at Rome, where I wrote a new world record in 400m. The single mistake of looking back at my rivals cost me so dearly," admits the Flying Sikh now. But now he lives a contented, retired life in Chandigarh with his wife, Nirmal. The trend set by them has seen many outstanding sportsmen and women entering into matrimonial alliances. Dr Vace Paes, a hockey Olympian himself, and father of Atlanta Olympic Games bronze medallist,Leander Paes, is married to a basketball player of his time. Hockey men top the list as Ajit Pal Singh, Surjit Singh, Gurmail Singh, Balwinder Singh and Joaquim Carvalho have all married outstanding sportswomen. Surjit, Gurmail and Balwinder married hockey players while Ajit Pal married basketball star, Kiran. Joaquim carvalho married track queen Vandana Rao. National badminton champion Syed Modi married shuttler Amita. Unfortunately, Syed Modi did not live for long after the wedding. Paramjit Singh, who is credited with breaking Milkha Singh's record in 400 metres at the Calcutta meet, married another track and field queen Binamol, while J. Singh and his wife,Neelam, a thrower, are also from track and field. Other example of athletic couple has been of Wilson Cherian and Shiny Abraham.Pravin Thipsay and Bhagyashree are both chess players. Faroukh Khodaij and Kaity, Kamlesh Mehta and Monalisa Barua are couples in tennis. Another couple that was united by love for sport is Wing Commander M.M. Singh and Amrita Mohan Singh—both from Ludhiana. An Arjun Award-winner, M.M Singh was the captain of the national basketball team, while Amrita was the captain of the Punjab women’s team. P.S.